Apple (AAPL) is giving its iMac line of desktop computers a serious power boost. The company on Tuesday announced that it's bringing high-powered, 8th-generation and 9th-generation Intel (INTC) processors to the all-in-ones, marking the first major updates for the systems since 2017. In addition to their new processors, the iMacs are getting improved graphics chips, which should go a long way in helping gamers and amateur and professional photo and video editors. Available for order starting Tuesday, the new iMacs are sure to please fans of the desktops who have been chomping at the bit for performance upgrades to the systems for some time. Apple's previous generation of iMacs were no slouches in their own right. The desktops are famous for their longevity, lasting several years at a clip before giving up the ghost, or being passed on to a younger family member thanks to their performance. And the new models are expected to be no exception. The 21.5-inch iMac, which is the range's entry-level size, will come with an 8th-generation, 4-core Intel Core processor standard. You'll also, for the first time, be able to opt for a beefy 6-core Intel processor, which Apple says will boost performance for the iMac by a whopping 60%. Multi-core CPUs are important for things like multitasking and heavy-duty processing. On the graphics side of things, the 21.5-inch iMac will now feature AMD's (AMD) Radeon Pro Vega graphics chips. Apple says that will send graphics performance soaring by 80%. The 21.5-inch iMac is the version that most consumers are likely to consider thanks to its $1,299 price tag. And the addition of more powerful processors and vastly improved graphics performance will make the iMac all the more attractive. Then there's the 27-inch iMac, which will be a freakishly powerful machine. Apple says the desktop will be available with 6-core Intel processors across the board. But if you're hoping for even more oomph, you'll be able to opt for a 9th-generation, 8-core Intel chip. Those changes mean you'll get twice the performance out of this bad boy. Like the 21.5-inch iMac, the 27-inch all-in-one will get AMD Radeon Pro Vega graphics. Outside, the 21.5-inch and 27-inch iMacs are identical to their predecessors. The 21.5-inch iMac also features a Retina 4K display, while the 27-inch gets a Retina 5K display. Apple will still sell the non-Retina 21.5-inch model, but it doesn't get any upgrades. It costs $1,099. Of course, Apple isn't the only all-in-one maker offering powerful performance in a compact package. HP and Dell both offer their own powerful multi-core all-in-one desktops. The Dell (DELL) Inspiron 27 7000 packs an 8-core AMD Ryzen processor and AMD Radeon RX 580 graphics chip for $1,399, while HP's (HPQ) Envy all-in-one comes with a 6-core Intel processor and Nvidia GTX 1050 graphics chip for $1,449. Despite the jump in power for the 21.5 and 27-inch iMacs, Apple is keen to point out that these are built with all consumers in mind. 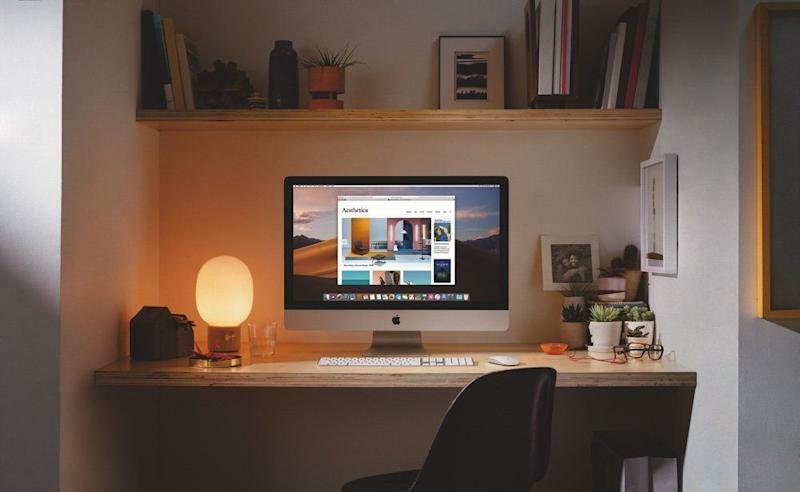 The company recognizes that the iMac is the kind of desktop that families will purchase for use as a shared machine, or that students might use thanks to its space-saving design. Businesses and business users also opt for the iMac as their all-in-one of choice. Apple's Mac line of desktops and laptops make up a small percentage of the company's total sales. In Apple's most recent quarter, Mac sales accounted for $7.4 billion of the tech giant's $84.3 billion in total revenue. The iPhone, meanwhile, made up $51.9 billion. Still, Apple recognizes that its Mac lineup has a fiercely loyal user base. And while iPhone revenue fell in the previous quarter, Mac sales were up thanks to recent improvements to the company's MacBook line of laptops and Mac mini desktop. With the new iMacs, Apple might have a similar boost in revenue to look forward to in its upcoming quarter.